The first community health and wellbeing hubs are opening their doors across Fife. St Andrews was the second town to welcome the new unit after a successful pilot project in Dunfermline. It opened its doors last week. The aim is to co-ordinate health care services – and make it easier for patients who use different services. The hubs allow health care workers to co-ordinate and make sure all care needs are being met by visiting one referral service instead of being moved between several different ones. 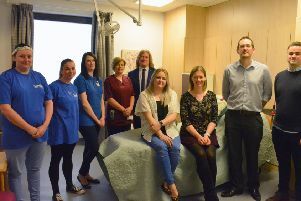 Charlie Chung, development lead commented: “We have been trialling this way of working in Dunfermline for over 18 months, and the feedback from patients and staff has been very encouraging. “If you have various health conditions and need to deal with a number of services, you end up answering the same questions over again. “In the hub, we are able to streamline this and avoid duplication. Anne McAlpine, clinical services manager, west division added: “I’m really proud of what we have achieved. Staff and patients have really embraced the change in how we are bringing together services and putting people at the heart of what we do, getting the service they need, in the right place and at the right time.